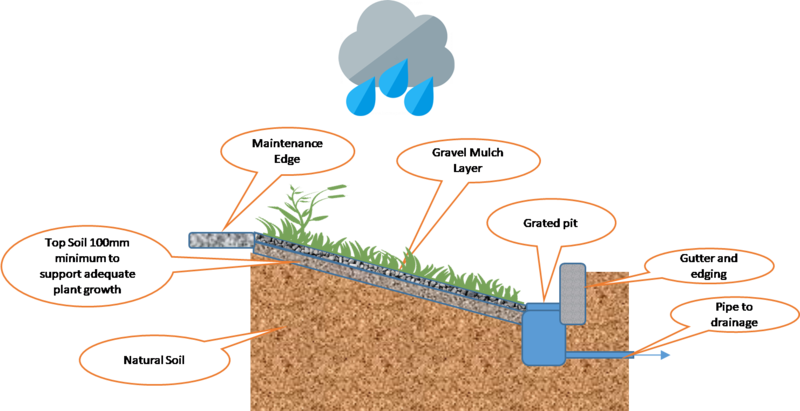 Infiltration systems function best when high-infiltration soil types are present (sand or mildly reactive clays). Many suburbs within the metropolitan Adelaide area are characterised by reactive clays not suited to these systems. An estimation of a sites soil type can usually be determined by looking at the site’s soil report that is used for foundation design. Alternatively, for more accurate results, a geotechnical engineer can be engaged to undertake site soil classification and percolation testing. For Australian conditions, a rule of thumb guide is for the area of your raingarden to be between 0.5‑2.0% of the area of the contributing catchment (e.g. area of roof or other impervious surfaces draining to the raingarden). 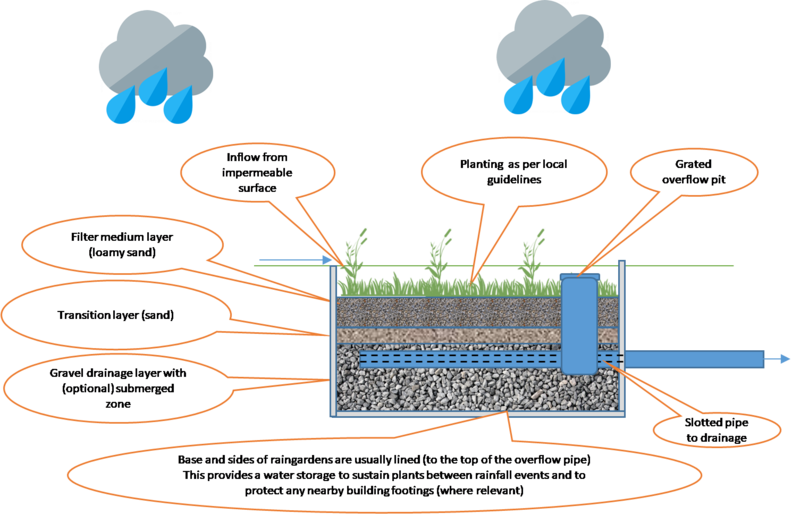 For more information and tools for sizing and designing a raingarden talk to your local Council drainage officer or local Water Authority. 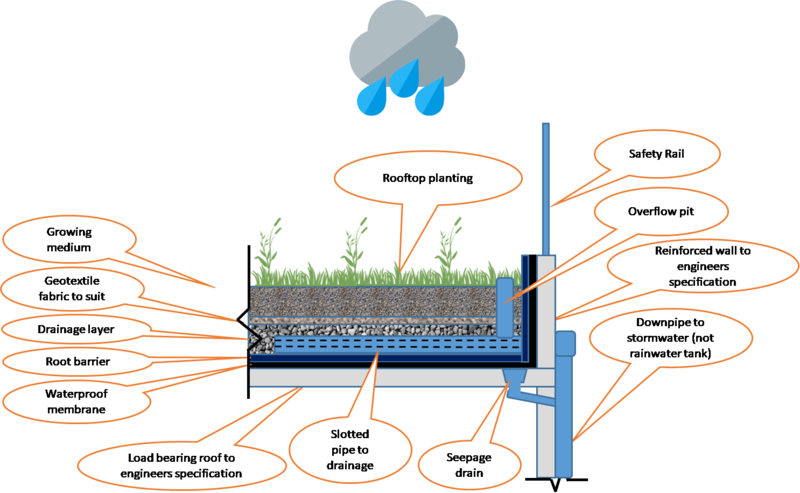 The most appropriate green roof for Australia is a deeper substrate, which consists of depths between 150 and 600 millimetres of growing medium. Care should be taken that a structural engineer certifies that the building design can support a green roof, and that the design is resistant to heatwaves, as green roofs can “cook” in high temperatures, killing the vegetation. Design responses to improve performance in high temperatures can include deeper growing medium; water storage crystals; effective irrigation; partial shading with vegetation or structures, e.g. solar panels; and the use of annual native grasses and other summer heat resistant species. ARI Average recurrence interval is defined as: The average, or expected, value of the periods between exceedances of a given rainfall total accumulated over a given duration. 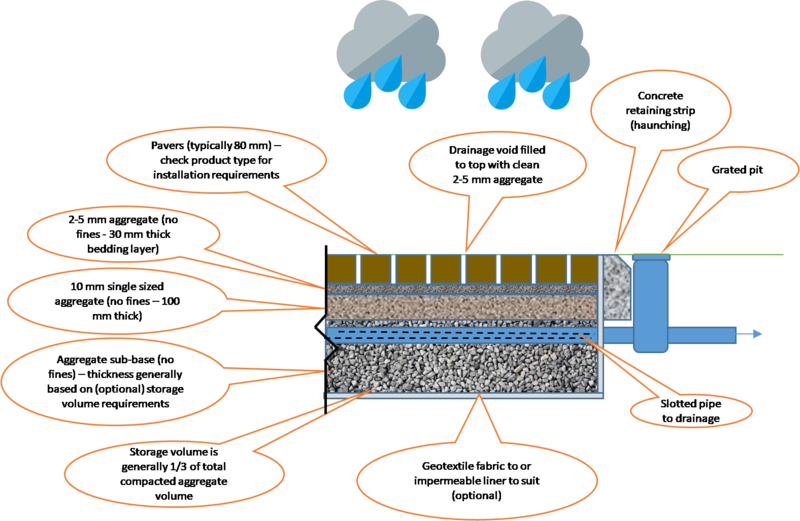 ARR 2016 Australian Rainfall and Runoff (Engineers Australia 2016, published at http://arr.ga.gov.au) is a national guideline document, data and software suite that is the default national standard for the estimation of design flood characteristics in Australia. Deemed to satisfy A simplified checklist approach to achieving compliance targets (as opposed to a custom designed or software modelled approach). EY Exceedances per year The number of times an event is likely to occur or be exceeded within any given year. Infill growth Growth occurring through densification of existing developed areas. 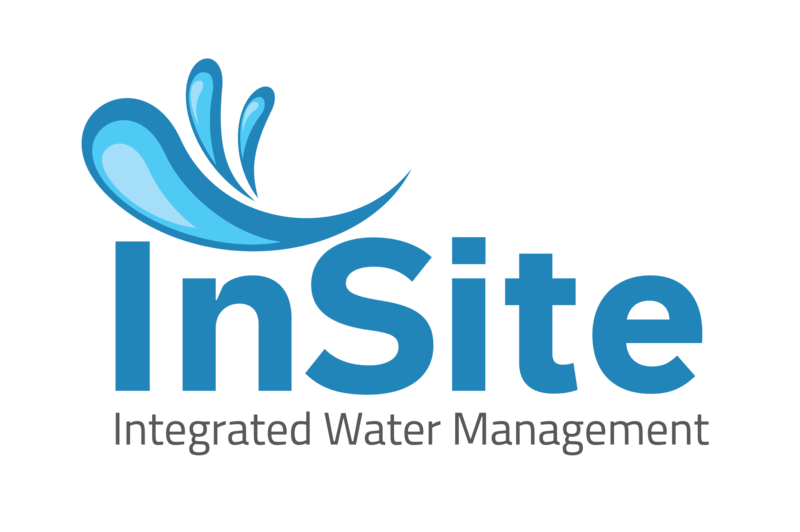 Integrated water management A multi-disciplinary and multi-objective approach for the sustainable use of available resources with the objectives of environmental protection, and minimising water demands, wastewater discharges and stormwater runoff. Kh Saturated Hydraulic Conductivity. If no data is available for a site, field hydraulic conductivity tests must be undertaken to confirm assumptions of soil hydraulic conductivity adopted during the concept design stage. Field soil hydraulic conductivity (Kh) can be determined using the falling head auger hole test method. 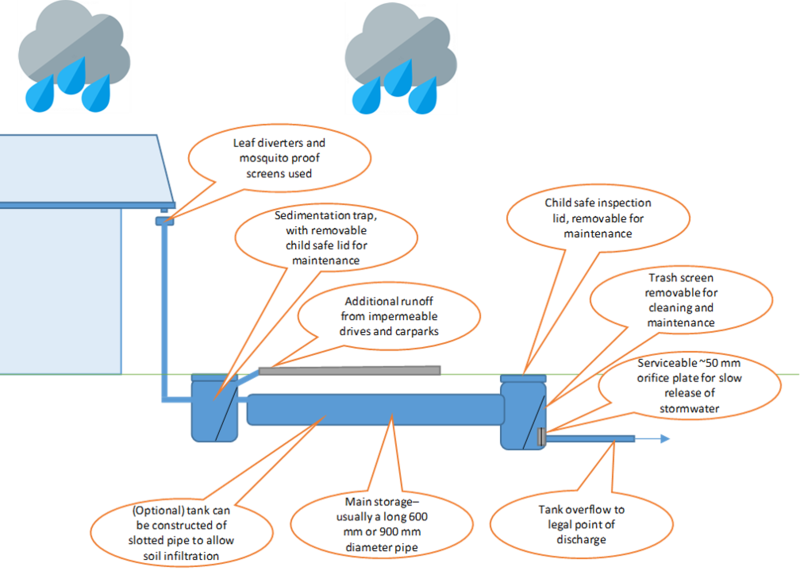 OSD On site detention A common practice of slowing down stormwater release rates into stormwater drains by using a detention tank with a known outflow rate. Rainwater Rainfall collected from the roofs of buildings. Rainwater tank A water tank that is used to collect and store rainwater runoff, typically from rooftops via rain gutters. Soil site classification Soils site classification is according to Australian Standard AS 2870/2011 – Residential slabs and footings Site classifications and movement are based on soil reactivity Class A (0-10mm) Stable, non-reactive. Most sand and rock sites. Little or no ground movement likely as a result of moisture changes. Class S (10-20mm) Slightly reactive clay sites. May experience slight ground movement as a result of moisture changes. Class M / M-D (20-40mm) Moderately reactive clay or silt sites. May experience moderate ground movement as a result of soil conditions and moisture changes. Class H1 / H1-D (40-60mm) Highly reactive clay sites. May experience a high amount of ground movement as a result of soil conditions and moisture changes. Class H2 / H2-D (60-75mm) Highly reactive clay sites. May experience very high ground movement as a result of soil conditions and moisture changes. Class E / E-D (75mm+) Extremely reactive sites. May experience extreme amounts of ground movement as a result of soil conditions and moisture changes. Class P (this is approximately 70% of building sites in Australia) Problem sites. Sites may be classified as ‘Class P’ as a result of mine subsidence, landslip, collapse activity or coastal erosion (e.g. dunes), soft soils with a lack of suitable bearing, cut and/or filled sites, or creep areas. Ground movement as a result of moisture changes may be very severe. If you are building on a Class P site you will need to consult a structural engineer. The ‘D‘ inclusion (i.e M-D, H1-D, H2-D or E-D) The ‘D’ in these classifications refers to ‘deep’ movements in soil due to deep variances in moisture. These classifications are mostly found in dry areas. 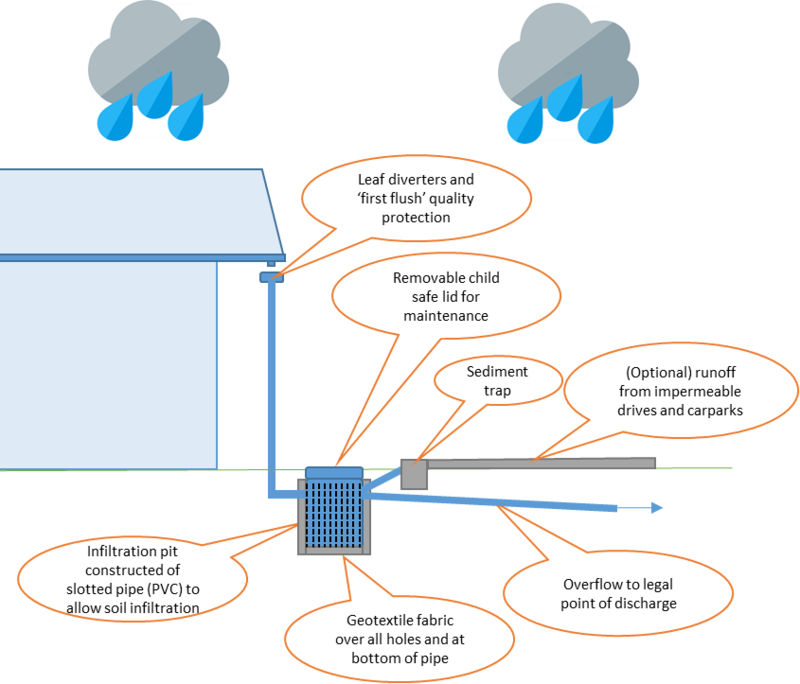 Stormwater Rainfall that runs off all urban surfaces such as roofs, pavements, car parks, roads, gardens and vegetated open space. TN Total nitrogen The sum of the nitrogen present in all nitrogen-containing components in a given water sample at certain temperature over a specific time period. Best practice is a 45% reduction target of typical urban annual load. TP Total phosphorus The sum of the phosphorus present in all phosphorus-containing components in a given water sample at certain temperature over a specific time period. Best practice is a 45% reduction target of typical urban annual load. TSS Total suspended solids A water quality measurement of the mass of fine inorganic particles suspended in a given water sample at a certain temperature over a specific time period. Best practice is an 80% reduction target of typical urban annual load. 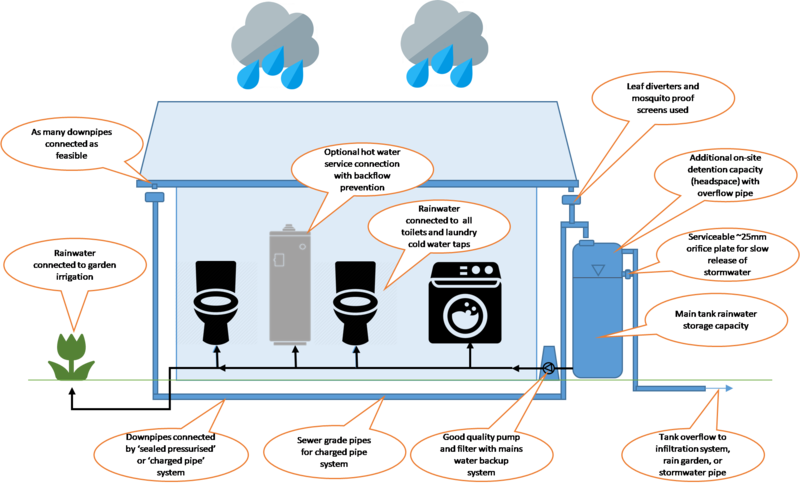 WELS Australian Water Efficiency Labelling Standards scheme. WSUD Water sensitive urban design Design principles that aim to reduce the impact of interactions between the urban built form and the urban water cycle including surface water, potable water, groundwater, urban and roof runoff, wastewater and stormwater. Manage expectations and risks around occasional surface water and ponding. Ensure that uncontrolled stormwater does not flow over property boundaries or otherwise cause a nuisance. Plan for major flood pathways – locate away from, adapt (raise floors above predicted flood levels) and defend buildings against potential major flooding. Plan to reduce annual average damages and safety risks. 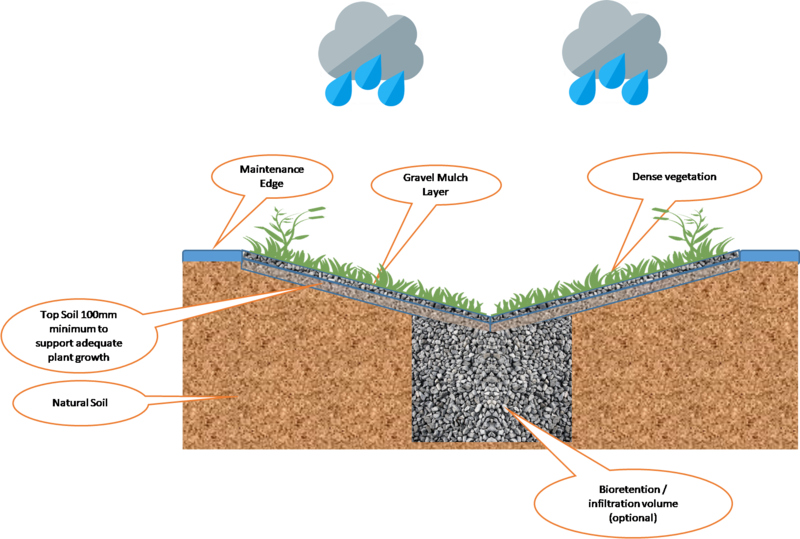 Take into account local conditions such as slope, topography and soils (type, reactivity, permeability, water table level, salinity, dispersiveness, acid sulphate soils, etc.). Ensure that soil moisture and building clearance is considered in areas of reactive clays or where varying soil moisture levels could damage buildings, infrastructure or other constructions. For steeper sites, ensure the design includes geotechnical considerations such as slope stability with varying soil saturation levels. Compliance with other Australian Standards, laws, guidelines, regulations and Council requirements.